If you want to read the rest of the posts about books I met, read, and fell in love with this year, you can check out part 2, part 3, part 4, part 5, and my review of Gilead. This has been a year of epic reading. I don’t know if it’s the cold weather, Taylor’s huge workload for school, or all the new books coming my way now that I work in publishing, but I have been on a reading tear this year. When I was still a student, I found time to read a respectable number of books in my free time. But once I dropped out of seminary, it was like the floodgates of reading opened. I’ve spent this year happily swimming through book after book after book and I will continue to do so until I drown in them. Which, looking at my to-read list, isn’t an impossibility. So Amy’s thought was quite true for my year of epic reads — which is to be expected because Amy is, among many other things, very wise. I found eight new books this year that I absolutely love. This mini series is a short summary of my favorite new reads of 2014 (excluding Gilead, which I already blogged about over here). Before you read anything else, pause and take a look at this pretty new Harper Perennial Olive edition. How lovely is that? I now own two copies of this book, which is fitting because I initially picked up the book because I liked the cover. I know, I know, it’s bad to judge a book by its cover.But I do. Often. Didn’t I say I was going to be honest on this blog? First things first: this book isn’t perfect, and I’ll be the first to admit it. It’s a pretty melodramatic. I felt manipulated at times by how easily it made me cry or feel outrage at the injustice occurring in the book. There are far too many self-help style mantras throughout. Cue me reading with lots of eye rolling. I skimmed over almost every section about famous car races, tracks,and drivers because I don’t care. But inspite of its flaws, this book still charmed the heck out of me. The narrator is the family dog, and his love for his owner is nothing less than you would expect from man’s best friend. Yes, I get that it sounds ridiculous. It is. But it is also fantastic. Hearing the trials and tribulations of a family communicated from the perspective of the pet is unusual, but increasingly endearing. Stein also takes full advantage of the comedic opportunities such a POV opens up. I laughed, I cried, I hugged my dog–everything a great book should inspire you to do, right? This isn’t a literary masterpiece or a perfect book, but I loved it all the same. If you post more Instagram photos of your dog than anything else, have been accused of talking to or about your dog in excess, or have ever taken a Christmas card photo that includes your dog, this might be a book for you. 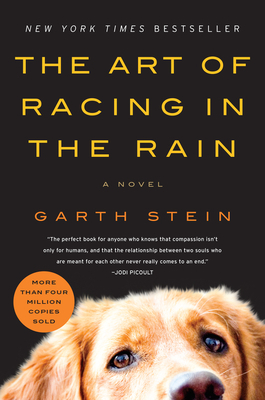 The Art of Racing in the Rain: what’s your verdict? Did it bring up all the warm fuzzies or did it turn you into a cat person?